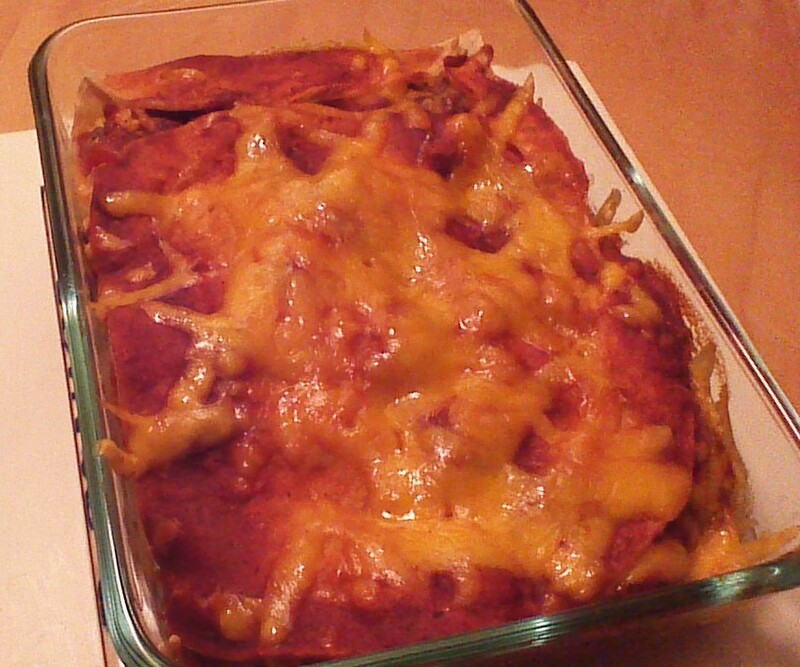 Is it an enchilada, or is it a lasagna? A bit of both, I suppose. Here’s the dilemma… traditional corn tortillas are delicious, and are nutritionally superior to American-style flour tortillas. The problem is, traditional corn tortillas aren’t quite as pliable, and have a tendency to break into a crumbly mess when you try to roll them up! One easy solution is to simply leave them flat. This recipe takes advantage of the flavor combinations found in Mexican enchiladas, but with an ease of assembly mimicking an Italian lasagna. I baked this dish in four, individual serving baking dishes to freeze for workday lunches. If you’d prefer to make a single, 9×13 inch rectangular pan, just double the recipe! Step 1) Brown ground beef in a skillet over medium heat, stirring frequently. Drain well. 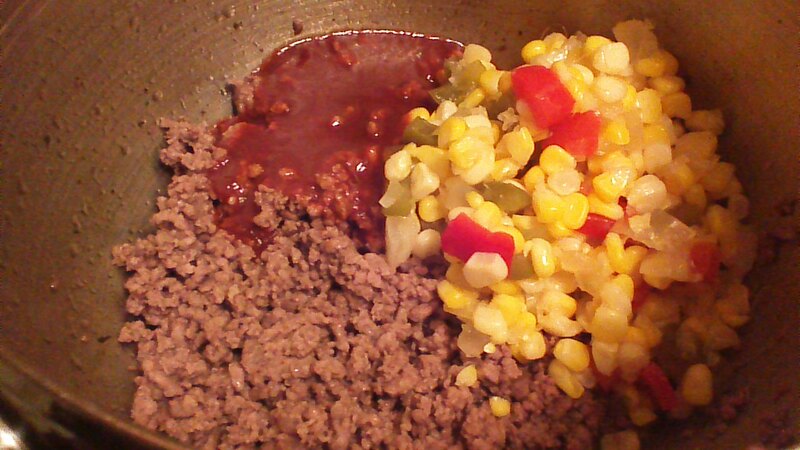 Step 2) Add corn, peppers, onion, and half of the enchilada sauce to the ground beef. Stir to combine. Step 3) In a separate bowl, blend together the refried beans and diced tomatoes. Step 4) Layer 1 corn tortilla in the bottom of each greased, oven-safe lunch container (trim tortilla if needed). Spread a thin layer of refried bean mixture over the tortilla, followed by a layer of the ground beef mixture, and a sprinkle of cheese. REPEAT the layers a second time. 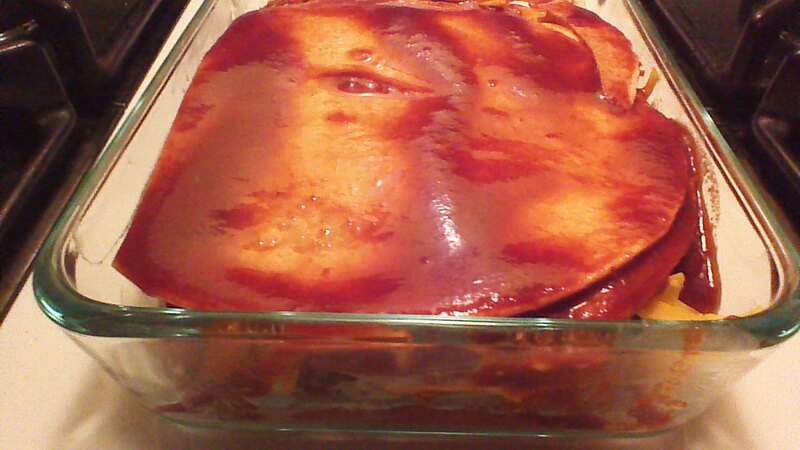 Step 5) Top each Enchilada Lasagna with remaining enchilada sauce and cheese. Bake, uncovered, in a preheated 350 degree oven until cheese is bubbly and beginning to brown. Enjoy warm. If freezing to enjoy in the future, allow to cool completely before wrapping airtight and freezing. Thaw in the refrigerator overnight and enjoy within 1 month for best flavor.